What is Durham 150? Who is organizing it? Durham 150 is charged with spearheading efforts to recognize Durham’s past, present, and future with a year of events, activities, and community engagement. To kickoff planning for the City of Durham’s 150th anniversary, Mayor Schewel assembled a group of Durham residents and identified members to lead the sesquicentennial’s official promotions and celebrations. Leaders from Discover Durham, formerly the Durham Convention & Visitors Bureau, and the Museum of Durham History were designated as the convening group’s co-chairs. As a celebration, Durham 150 is a community-wide effort to celebrate Durham’s past, present, and future. When is the anniversary date? The 150th anniversary of the City of Durham’s incorporation will take place on April 13, 2019, though Durham 150 is planning to celebrate the sesquicentennial throughout the entire 2019 calendar year. Why is the celebration important? To celebrate Durham’s 150th anniversary is to rightfully honor the changemakers who shaped Durham’s unique sense of place. It’s to rightfully tout Durham’s position for the future. It is a chance to mobilize partners, rally proud Durhamites, and invite the world to experience all that we know the Bull City offers. It is also an opportunity to come together and prepare for Durham’s next 150 years. What are the events of Durham 150? The Durham 150 convening group and its committees are organizing a public kickoff of the sesquicentennial efforts during the 2018 holiday parade in Downtown Durham, an opening ceremony event to be held in April 2019, and a closing event to culminate the yearlong efforts in November 2019. 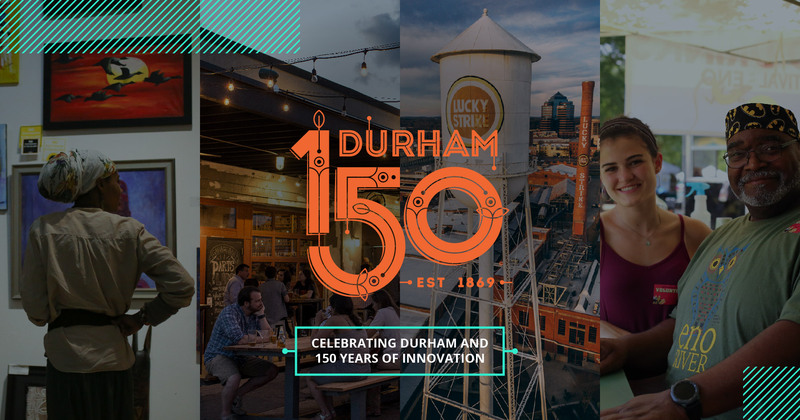 Throughout 2019, Durham 150 will provide marketing support and visibility for 150+ events held by other partners, businesses, and residents as they are approved. The celebration is supported by the engagement and generous contributions of Durham residents, businesses, and organizations. Durham 150 is pleased to offer a grants program for organizations and events in need of seed money to get started with sesquicentennial-aligned activations. There are also 150+ community events and projects that will take place for you to attend or support. Interested in hosting your own event or starting your own initiative? Visit the Present and Future pages for more information.